The front cover of the Indo today is a piece entitled: ‘Central Bank figures ‘overstating’ number in mortgage crisis‘. The piece argues that the issue of mortgage arrears is not as problematic as it might be assumed from the figures. Noting that 77,630 mortgages are more 90 days in arrears at the end of March 2012, the argument is that the “figures include several types of borrowers who are no longer in trouble [such as] those who missed payments long ago and have since resumed paying normally; those who fell behind and agreed ‘restructuring’ deals with their banks to lessen monthly payments; those who have successfully done more informal deals to work through their mortgage problems.” So, is it the case that the mortgage crisis is overstated? 77,630 are in arrears of 90+ days (10.2%) a proportion of which has restructured but nonetheless are still 90+ days in arrears (41,054 mortgages are restructured and are in arrears of varying lengths, both more and less than 90 days). 38,658 are restructured and are performing as per new schedule, though this is an impaired schedule that will have to be re-regularised at some point. 59,437 of mortgages are 180+ days in arrears at end-March 2012, equivalent to 7.8 per cent of the total stock. The Central Bank data shows that the figures for those in 90+ days in arrears has been consistently growing over the past number of years. The figures at the end of June will give us some indication as to whether things have improved, but it seems unlikely given the trend for people is to slip in 180+ days arrears rather than out of the +90 days, and even then it is more likely that they will become restructured rather than impair free. To claim that a restructured mortgage is one that is not in trouble is incredibly disingenuous; it is restructured precisely because it is in crisis. One other thing to note about the Central Bank data is that it relates to a “mortgage on the residential property which is or will be occupied by the borrower as his/her principal private residence”. It does not include buy-to-let or buy-to-flip mortgages related to property the holder is not living in. It would be very interesting to know about arrears and restructuring with respect to these mortgages, which in 2007 were 27% of all new mortgages. The suspicion is that these are in just as bad a state as residential mortgages. There is no doubt that having 116,288 (15.2%) mortgages in arrears of 90+ days or restructured constitutes a crisis. 1 in 6 mortgages in the state is in some form of trouble. The restructuring of payments is helping households, but just because a household is now managing to make payments does not mean the mortgage is now performing as it should – it is either still in arrears or the payment is not on schedule to pay off both the capital and interest owed. I’m not really sure what the Indo is hoping to achieve with the article, other than to make a bad situation seem better than it actually is or to try and bolster confidence in the banks. I doubt it’s made anyone who continues to struggle with paying their mortgage feel any better. 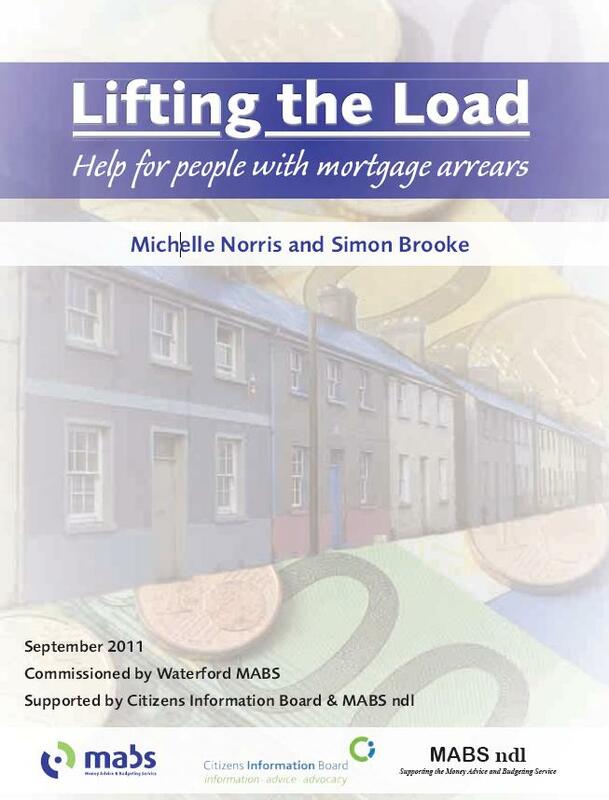 The Lifting the Load report on mortgage arrears, commissioned by Waterford MABS and written by Michelle Norris and Simon Brooke, makes for a stimulating and often emotionally poignant read. As previously reported on this site, drawing on desk-based research and in-depth interviews with MABS clients this study gives a fascinating insight into how households became indebted and how they are currently negotiating this indebtedness with lenders. Moreover, perhaps more than any other study completed thus far Lifting the Load offers a much needed look at how the crisis in banking and property has affected the lives of individuals and families. The interview material presented in the report is candid and often paints an alarming picture of the affects of stress on those experiencing mortgage arrears; resulting in marital and familial strife, serious depression, and in the case of one interviewee attempted suicide. It is clear from reading the report that, for those in mortgage arrears, their financial worries have taken on an all-encompassing strangle-hold on their lives. It is a source of constant worry that perforates all aspects of their day-to-day existence. Everything is tinged with the burden of debt. Their identity is swept up in and transformed through being in debt, by the perpetual anxiety about what the future will hold. Nor are these all stories of families and individuals trying desperately to cling to their homes; for some of those interviewed their house is no longer a home but a constant reminder of their debt, and they would gladly hand back the keys and be done with it. I have a legal and moral responsibility to pay this [debt] back. I accept that. But I also think the banks have a moral and legal responsibility for getting us into the position we’re in. But they seem to be walking away scot free. I can’t. They can. That to me is completely immoral. But in a court of law it’s not measured that way. And I will lose every time, because in a court of law you can’t take account of my emotional, my personal, feelings. The experiences of those interviewed in dealing with lenders vary considerably. The report suggests that, in general, those who contacted their lender soon after getting into mortgage difficulty had more positive experiences with regard to restructuring repayments than those who waited, and that lenders have become more amenable to negotiating alternative repayment arrangements in recent years. This willingness of lenders to avoid repossession is indicative of the current dearth in the property market, and has been coupled with short-term alleviative instruments (primarily Mortgage Interest Supplement) brought in by Government. The report makes clear, however, that in many cases such instruments will be insufficient to get borrowers into a position where they can securely pay back their debts. Furthermore, given that one of the reasons for lenders’ current avoidance of repossession is the severe depreciation of the asset resultant from the property crash, a rise in house prices would present a very different set of potential options for lenders, making foreclosure a perhaps more lucrative and thus inviting prospect. Meaning: the situation around mortgage arrears is a burgeoning crisis that is currently being addressed in a stopgap manner that belies the fundamental juncture that the crash of the property market represented. Radical measures (in recognition of this fundamental juncture) have been taken with regard to lenders, but this has not been extended to borrowers. The report tracks the experience of borrowers through their pathways into/through/out of arrears. What is striking in this approach is that it offers a vantage point through which to view the shifting public and personal circumstances that structure interviewees’ experiences of indebtedness. The interview material relating to ‘pathways into arrears’ (although conducted retrospectively) points towards the all-encompassing property discourses that characterised Celtic Tiger Ireland. Various interviewees suggested feeling pressured to get onto the ‘property ladder’, some now acknowledging that seeking social housing would have been more appropriate, while a significant proportion of those who admitted to having mortgages that were never affordable borrowed from sub-prime lenders. These factors are indicative of how pervasive discourses of home-ownership were during this period. For a sizable proportion of those interviewed, although the amount borrowed was perhaps disproportionate to their salaries at the time of borrowing, repayment of debts only became a significant problem when one or both partners in a household was made unemployed. One interviewee suggested being “naive enough to think that I would always have the job…”. This point is revealing, I think, of a sentiment that was broadly held (to varying degrees) by the majority of the population during the boom years. There was a tacitly held belief that unemployment would stay low and that there would be work available for those who were looking for it, now and in the future. Morgan Kelly, in an article in the Irish Times dated 29 December 2009, made the point that the benefits of the Celtic Tiger “…went overwhelmingly to ordinary people in the form of something that Ireland had never seen before: abundant jobs”. He argues that if these jobs (particularly for “…less educated men who were able to earn a good living in construction”) have disappeared forever, Ireland could be on the cusp of endemic social problems, particularly when heavy debt and the prospect of losing one’s home are added to the sense of uselessness stemming from long-term unemployment. The feeling of security created by abundant jobs also goes some way to explain why multiple indebtedness (from credit union debt, personal loans, and credit card debt) played such a significant role in exacerbating households’ debt problems. Some households remortgaged their houses (often with a sub-prime lender) in an attempt to get back on track with mortgage payments that had gone into arrears, to save an ailing business, or to clear other accumulated debts. More households ended up ‘robbing Peter to pay Paul’ in one form or another. While some of these choices were clearly down to poor judgement on the part of households, the reasons underpinning this do not stop at personal culpability. As David Harvey has suggested, access to credit (particularly on a personal level) was the chief innovation of the last round of capitalist accumulation, bourn from the situation whereby wage-levels decreased overall but Western nations were increasingly dependent on a consumer-driven economy. To overcome this contradiction, access to credit was encouraged and facilitated at a structural and policy level. We witnessed this in Ireland through the introduction of financial instruments such as 100% mortgages, and through the Government’s incresed withdrawal from social housing provision during the boom. Additionally some interviewees here suggested receiving poor advice from mortgage brokers who they felt pushed them towards sub-prime lenders and gave them overly-optimistic diagnostics on the profitability of a family business. Again the overwhelming picture presented here is of a whole system geared towards encouraging indebtedness. If we now have a clearer view of the insanity of this system, we should not be too quick to forget how difficult such a perspective was to come by when the country was in the midst of this all-encompassing property mania. The Lifting the Load report offers a nuanced and complex portrait of households’ experience with mortgage debt. While it doesn’t point towards anything like a common narrative, what is clear is that indebtedness has serious ramifications for individuals’ mental health and family well-being, and also for the wider economy and society. The dramatically changed circumstances in which these households find themselves are testament to the seismic shift that Ireland has undergone in the last three years. The mortgages these households are repaying no longer correspond to current realities, but to some dreamlike fantasy. The severity of this disjuncture seems to suggest that these problems cannot be remedied by the corrective forces of the market. As the report points out, doing nothing will be more costly in the long run than taking measures to address the issue. Reading this, I was struck yet again by the inadequacy of the policy of austerity. The country we are all now living in is so dramatically altered, the residual of the catastrophic property bubble so overwhelming, that simply alleviating the symptoms while waiting for the market to auto-correct will almost certainly just delay the crescendo of these problems. Regardless of how contentious an issue public spending has become of late, Irish citizens deserve an open and frank discussion around the issues that will require significant capital investment by the state. Playing the austerity waiting game does nothing to plan proactively for any of our futures, and will just delay inevitable public spending further down the road. Anyone interested in the effects of the crisis on households who are struggling to pay their mortgages should take a look at Michelle Norris and Simon Brooke’s lengthy report for MABS on the issue – Lifting the load: Help for people with mortgage arrears. The report is based on desk research with respect to government and industry data and policy responses, and interviews conducted with 49 MABS clients (in 43 households, in nine MABS offices across the country). Divided into six sections the report details the study parameters, provides a general overview of the housing bubble and bust, details pathways into and through arrears from the perspective of households, and looks at prospective pathways out of arrears. The study gives a fascinating insight into how households became indebted (mortgages and other credit) and how they are trying to negotiate their various debts, including dealing with mortgage arrears. The report concludes by noting that ‘the costs to the State of putting in place appropriate measures to tackle the issue of mortgage arrears will be less than the costs of not doing so’, and it makes a number of recommendations with respect to changes in policy interventions.